LAUSANNE, Switzerland (AP) — Boxing still risks being kicked out of the 2020 Tokyo Olympics amid concerns over the sport's governing body, the IOC said on Thursday. 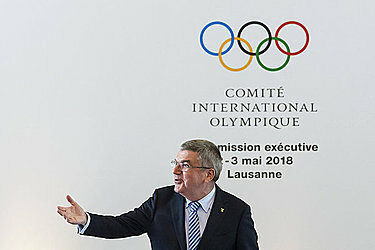 International Olympic Committee President Thomas Bach said issues remained over "governance, financial and sporting integrity" at the Lausanne-based boxing organization. The IOC executive board warned AIBA about its Olympic status in February, and a recent update report "still lacks substance," said Bach as he asked for a fresh update before the next board meeting in July. Bach cites "serious factual issues" as well as concerns about AIBA's leader. The U.S. Treasury Department has said interim president Gafur Rakhimov of Uzbekistan was involved in heroin trading and froze assets he held in American jurisdiction. "It's not a personal matter, at least not only a personal matter," Bach said of the IOC's concerns, which included a freeze on Olympic funding since December. Governments who "clearly abuse sport for their political purposes" were criticized, as Bach noted a case last month of a Tunisian court blocking four Israelis from competing at the taekwondo junior world championships. The IOC has now put on ice Tunisia's interest in hosting the 2022 Youth Olympics. With Africa the IOC's preferred choice to host its first Youth Olympics, Botswana, Nigeria and Senegal are also in contention. The IBU's longtime president and CEO-like general secretary left his role last month after being implicated in bribery, fraud and the covering up of Russian doping cases from 2012 through the 2017 world championships, held in Austria. Meanwhile, the World Anti-Doping Agency's investigation department has provided information ahead of police raids in three countries. A lawyer for Russian doping whistleblower Grigory Rodchenkov said the former Moscow laboratory director helped the probe.